Micro controller board designed to control up to 6 circuits with 1 compressor each, ten 0-5vdc sensor inputs, six relay outputs fused at 5 amps, four 0-10vdc analog outputs, one TRIAC for digital scroll control, real time clock. MCS-I/O and Two-RS-485 communication ports. Standard with 2 x 16 backlit display and 6 button keypad interface. The Cover/LCD/Keypad can be removed from the MicroMag board and plugged into the backside of the MicroMag board for door mount option. Call MCS-SALES for kit option. 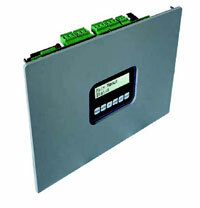 Description MicroMag with six key Keypad / LCD assembly, sealed NEMA4 enclosure, and mounting panel. Expansion board for use with a version 18 firmware MicroMag with sixteen 0-5vdc sensor inputs, four 0-10vdc analog outputs, MCS-I/O communication port, and no keypad or display. This board replaces the MicroSI8-AO4 and mounts in the same footprint. User field selectable 115vac or 230vac operation. Add these extensions to the end of the part number for a MCS-SI16-AO4 assembly listed above. Expansion board for use with a version 18 firmware MicroMag with ten 230vac 6.3amp relay outputs, MCS-I/O communication port, and no keypad or display. This board replaces the MicroRO6 and mounts in the same footprint. User field selectable 115vac or 230vac operation. Add these extensions to the end of the part number for an MCS-RO10 assembly listed above. Description The MCS-THERMOSTAT is a temperature and humidity sensing smart device with a backlit LCD display permitting remote adjustments to the MicroMag controller. This user friendly interface allows the viewing of 17 different parameters and has the ability to change 9 adjustable settings including cooling & heating system setpoints, operational schedules, holiday schedules, calibration and password protection. 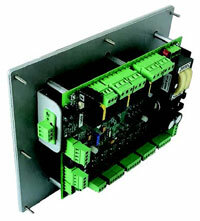 The MCS-DS-INTERFACE board is a substitute for the Copeland Scroll Digital™ Compressor Controller. The timing specifications are as specified by Copeland. The discharge temperature sensor can be a MCS-T100 temperature sensor or a Copeland discharge temperature sensor (Field selectable). Description MCS-DS-INTERFACE, mounts with four #6 sheet metal screws and comes with a Lexan cover. MCS-DS-COMM MODBUS or MCS-CONNECT communications interface board. Keyed mounting with nylon bolt to MCS-DS-INTERFACE. Description Converts MCS-MicroMag BACnet MSTP to IP. Must be factory programmed. Description The MCS-BMS-GATEWAY is a microprocessor based communication device that provides translation from BACnet MSTP to LonTalk on the MCS-MicroMag.